The included ServSafe® Certification Exam is available online in English, Spanish, and Chinese. The included “Exam Access Code” is a unique, one-time use number which the examinee must enter into the computer to access the exam. Only Registered ServSafe Instructors or Proctors may administer the ServSafe Online Exam. Either proctors or examinees may purchase Exam Access Codes. Purchased Exam Access Codes will be emailed directly to the purchaser’s email address. 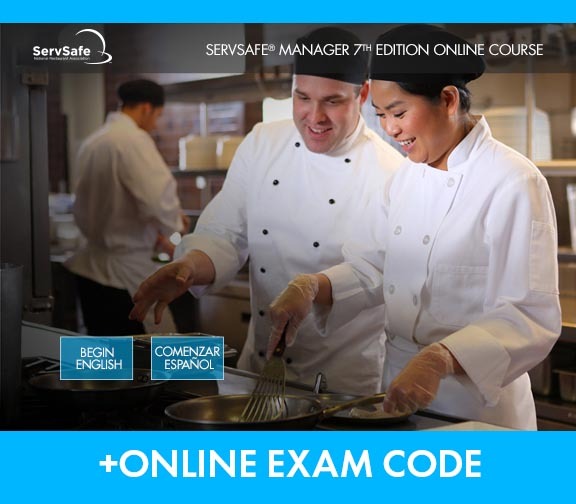 Purchase of the ServSafe Online Exam Voucher also includes administration, processing and a ServSafe certificate upon successful completion of the exam. IMPORTANT: Exam Access Codes are NOT refundable. You MUST have a registered ServSafe Instructor or Proctor administer the exam. You may not administer the exam to yourself. BEFORE PURCHASING: check with your state restaurant association, local health department or community college with a culinary or hospitality program to find out if a proctored online exam site is available in your area. Also read regulatory requirements to ensure the online exam is accepted in your area.